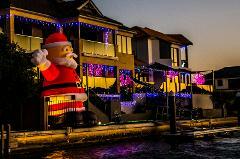 See over 200 Christmas houses along Mandurah’s famous canals lit up with thousands of Christmas lights in Western Australia's Christmas Lights Capital, Mandurah. 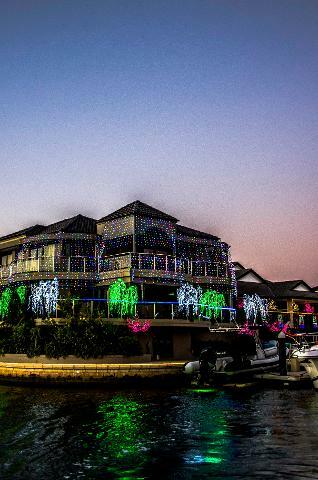 Get the ultimate 360 degree view of Mandurah’s famous Canal Christmas Lights onboard WA’s only donut-shaped electric boats. 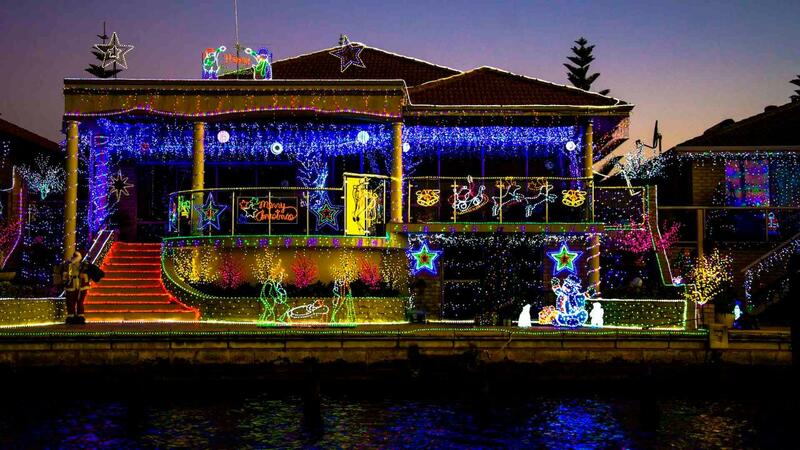 Enjoy the spectacular lights while comfortably sitting at a round table with a maximum of only 9 passengers per boat. If you would like to book the entire boat for a private tour including the tour guide, please choose 'Group of 9' in the booking form on the right. When you hire the entire boat, the boat with guide is yours for the tour regardless of the number of people (as long as there are no more than 9). $20 per child (up to 12 years)* - Not recommended for children aged 3 years and younger. $25 per child (up to 12 years)* - Not recommended for children aged 3 years and younger. *Children must be accompanied and supervised by a responsible adult. Bookings are available for individuals (single seat booking) as well as groups of up to 9 people. As we offer single seat booking for this tour, the booking calendar on the right shows the availability of seats onboard and NOT the availability of boats. We recommend bringing a jumper or jacket as it can get cool on the water in the evening. Bring your camera to capture the stunning Christmas Houses. BYO soft drinks and alcohol (max. 2 standard drinks per person) are permitted. We kindly ask you not to bring food or BBQ as this is a drinks & cruise only experience. Please do not bring snacks that make a mess such as nuts, chips or crackers. Due to limited space, we request that you do not bring your own esky. 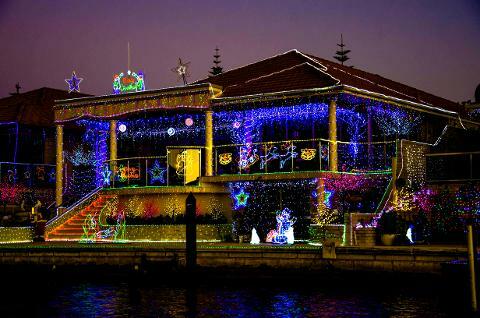 As our boats are open, all our Magical Christmas Lights Cruises are subject to weather. There is unfortunately no space for prams or strollers onboard. Our boats are unfortunately not wheelchair-friendly. As there are no toilets onboard our vessels, we recommend using public toilets prior to departure. Please notify us of any possible health conditions (e.g. walking problems, knee problems etc.) when booking and prior to boarding. The boat is moored to a floating jetty while passengers are embarking and disembarking the boat at night time. However, due to the boat's shape and construction a gangway cannot be used and the boat and jetty might move while you are embarking and disembarking it. If you have a pre-existing injury and/or medical condition and/or other concerns that could prevent you and/or other passengers in your group from safely embarking and disembarking the boat or from having a safe boat tour, we recommend not to book this experience or to get in touch with us on 0457 728 017 to discuss your concerns. If the tour has to be cancelled by Eco BBQ Boats due to bad weather conditions or low booking numbers, customers will be offered an alternative date or a full refund. Owing to high demand all payment must be made in full at booking time, and there are no refunds available on Christmas Lights cruises if you cancel your tour with less than 7 days notice, however we will try our best to re-schedule your tour if this is possible. If you cancel with at least 7 days notice, you will be given a full refund. 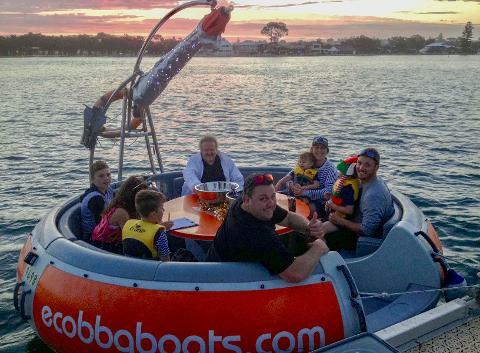 For more information go to ecobbqboats.com or call us on 0457 728 017.